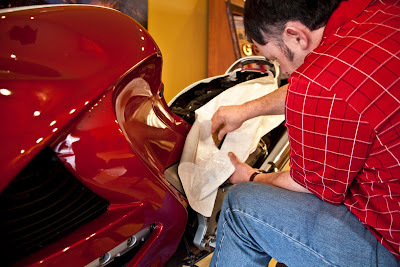 Trevor applying a custom motorcycle wrap. After the base wrap ("BMW" in ten point Helvetica at 40% Black. The belly pan and rear view mirrors will be wrapped in black carbon fiber vinyl with red carbon fiber racing stripes. A brushed glass BMW logo will be applied to the windshield.